Congratulations to horn graduate student Grace Shafer on being named one of the winners of the Symphonic Wind Ensemble's 2014-15 Concerto Competition. 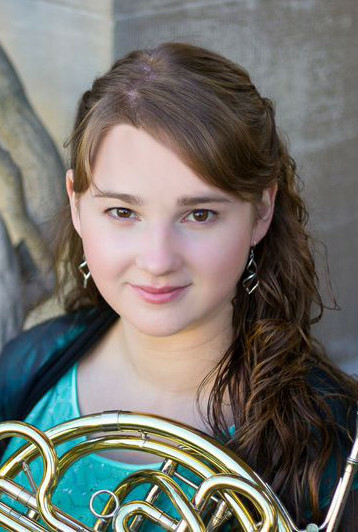 A student of Lisa Bontrager, she is a first-year master's student in horn performance and also serves as a graduate teaching assistant. She will perform "En Forêt" by Eugène Bozza with the wind ensemble at an upcoming performance. The daughter of Tim and Lou Ann Shafer of State College, Grace recently graduated from the Eastman School of Music. She has performed as a concerto soloist with the State College Area High School Orchestra and the Center Pennsylvania Youth Orchestra. During her undergraduate years, Grace won auditions in to play principal horn in major pieces performed by the Eastman School Symphony Orchestra and the Eastman Philharmonia. During the summers of 2009, 2010, and 2013 she attended the Bar Harbor Brass Festival, attended the Hot Springs Music Festival in 2013, and the Summer Brass Institute in 2014. Grace also enjoys playing the lesser known relatives of the modern horn, and has performed recitals and concerts using natural horn and Wagner Tuba. While Grace greatly enjoys playing in chamber ensembles and wind ensembles, she hopes to pursue a career in orchestral playing and teach horn privately.